Tsunami's Spyder Subwoofers Grilles Bring as Much Attitude to Speakers and Subs as The Hardpounding Tunes that Come out of Them. Tight in Every Sense of The Word, These Chromed-Out Rad Boys Provide The Finishing-Touch Bling When They Sit Down Beside 'ya. 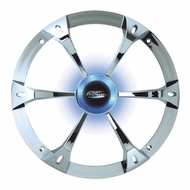 Made of Highquality Chrome-plated ABS, The Grille Spoke Pattern Protects Speakers and Subs From Damage. The Paintable Center Hub Insert Allows for A Custom Look to Match any Interior.